Dolph Ziggler has revealed he came close to being called up to the main roster as a protégé of Kurt Angle, until WWE's creative changed their minds and inserted him as a member of the Spirit Squad instead. 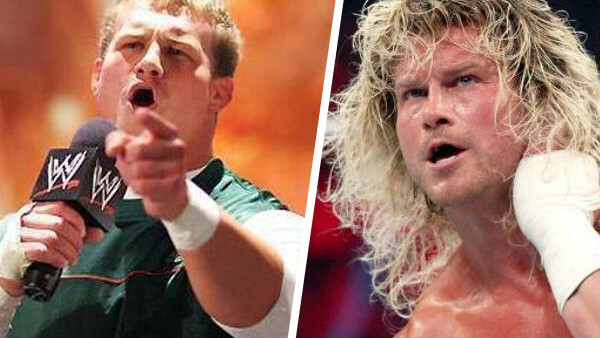 Speaking to Lilian Garcia on her 'Chasing Glory' podcast, Ziggler (who initially debuted as a caddy for Chavo Guerrero Jr's 'Kerwin White' character) discussed his career path and frustration with creative decisions that didn't go the way he'd wanted them to. "We really like that you have an amateur wrestling background...it's great that you have no tattoos, we're kinda looking at you as Kurt Angle's protégé or something." However, four weeks later he had been cast as "Nicky", a male cheerleader alongside Kenny, Mikey, Johnny and Mitch to form The Spirit Squad instead. "We were learning stuff that other people didn't get a chance to learn like on a regular basis, we were very spoiled. We were kinda seen as jokes but also we were fighting DX in the main event of a pay-per-view in a cage or something." The Spirit Squad were disbanded after being defeated by DX and Ric Flair in a five-on-three handicap match in November 2006, but Ziggler had gained all the training he needed to breakout on his own and become the WWE superstar he remains today.